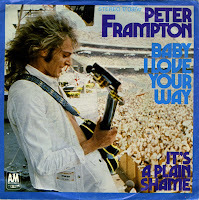 'Baby I love your way' was written and performed by Peter Frampton and originally featured on his 1975 album 'Frampton'. A live version of the song was released in 1976 on his live album 'Frampton comes alive!'. In this version, the track peaked at number 12 in America and number 43 in the UK.